I read a great article today on Entrepreneur.com – Get it Done: 35 Habits of the Most Productive People. The 35 habits are presented in an infographic, see the, How To Be Productive Infographic, here. The diagram in the infographic is broken down into seven areas: Tech, Clothes, Hacks, Body, Schedule, Food, and Mind. 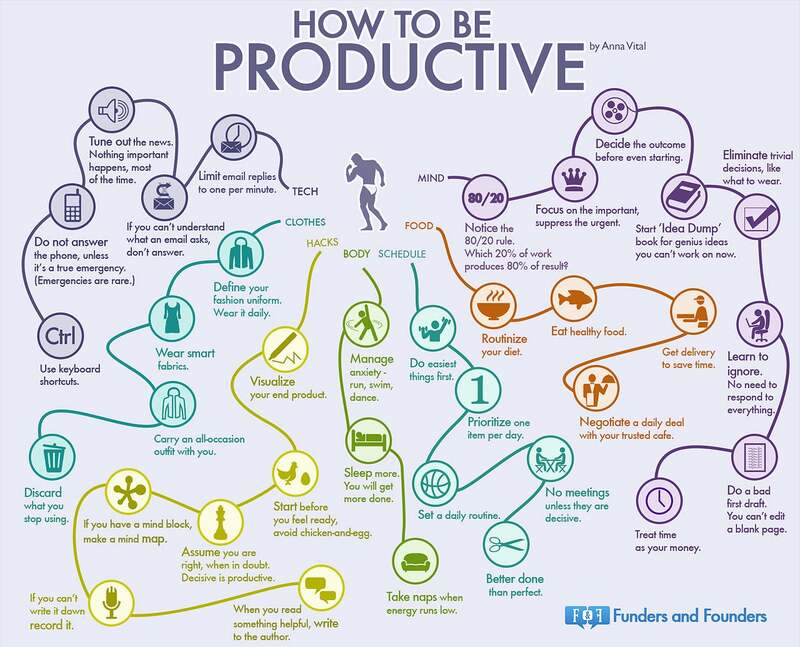 I think the infographic is exceptional because so many times I see information on productivity at work or productivity at home, as if these two are separate. For me, they aren’t. As an entrepreneur, I do it all, all the time, 24/7. I might be on a conference call at 7:00am or I might be on the elliptical. Heck, before I wrote this article I addressed Christmas cards to the family and when I’m done with this article I will be putting lights on the tree. Work and home mesh together, and that’s how I am most productive. If I get the right amount of sleep and exercise I am most productive at the office. If I constantly allow interruptions at the office, my day becomes longer, meaning I have less time for things at home. I’ve learned over the years that if I schedule myself and prioritize my activities I am the most productive, giving me the time I need to focus on the growth of my business. Take a look at the infographic and let me know what you think about the seven areas of productivity and the activities under each. Do you currently use any of these productivity points to help you be more productive? Do you agree that being more productive would help you grow your business?